For over 20 years, the charismatic character of The Real Effect has re-shaped the Jewellery industry. With their delicately hand crafted details, tried and tested methods date back across generations of silversmiths, with gorgeous pieces to suit every budget. Some of you know I got engaged last year, my fiancé proposed in a truly unique way with this beautiful charm bracelet. Without sounding like a total spoilt brat, I do miss not having the traditional ring to go with it. 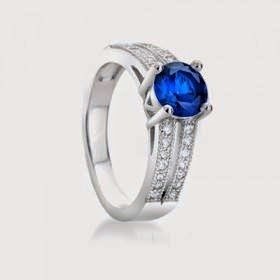 I would love something with a bit of colour like this Solitaire ring, with a beautiful blue sapphire set stone and split shoulders. The love the shape and the spilt shoulders really sets the ring off and makes it noticeable. 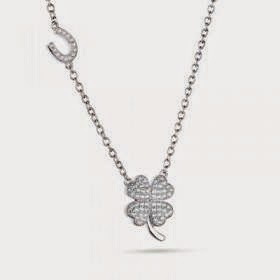 The next item I chose was this stunning necklace which has a four leaf clover and horseshoe. This sterling silver pendant is beautiful and really caught my eye. I'm a huge fan of competitions so I thought this would be perfect to suit my personally and my hobby. Thanks for your entry Tina. I wish you lots of luck in the competition and thanks for entering.